I remember when you shared this, Pat, but thanks for reminding me again. The idea is too cute to not make. Thanks for the reminder! An oldie, but goodie, for sure! I never realized how much I like red and yellow peppers until recently. Yum! Very cute Pat. First time for me to see this. Love it. It's adorable and very do-able. That's a winner in my book! Still a cute idea and one that has made me very hungry! Sooooo easy and so cute! 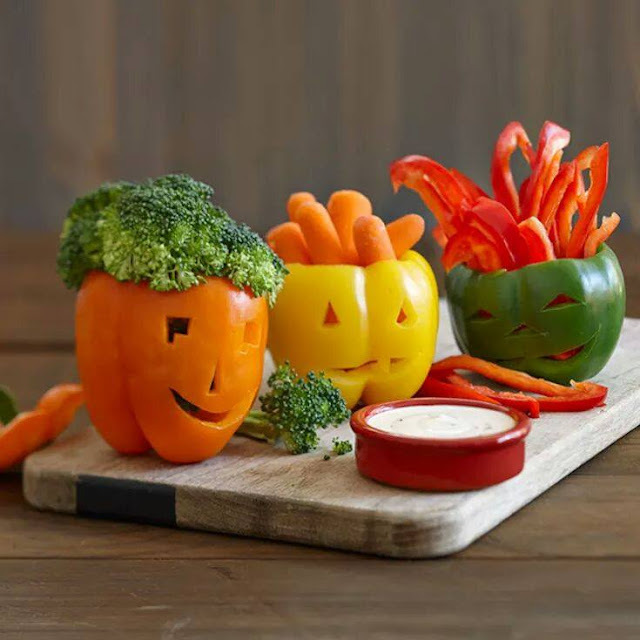 I bet that would make the little ones eat their veggies more! Cute, Pat. I think I may do this for my kiddos. They will be with me next weekend for a few days while mommy and daddy go to a wedding in Florida. We've got to pick out pumpkins to. I think we're gonna paint instead of carve this year. Painting is easier for the little ones. Well, if those aren't just the cutest! Thanks for sharing, sweet Pat. Hugs to you! What an adorable idea.......kids and parents alike will enjoy this. Well that is too darn cute:) Enjoy your day dear Pat, HUGS!